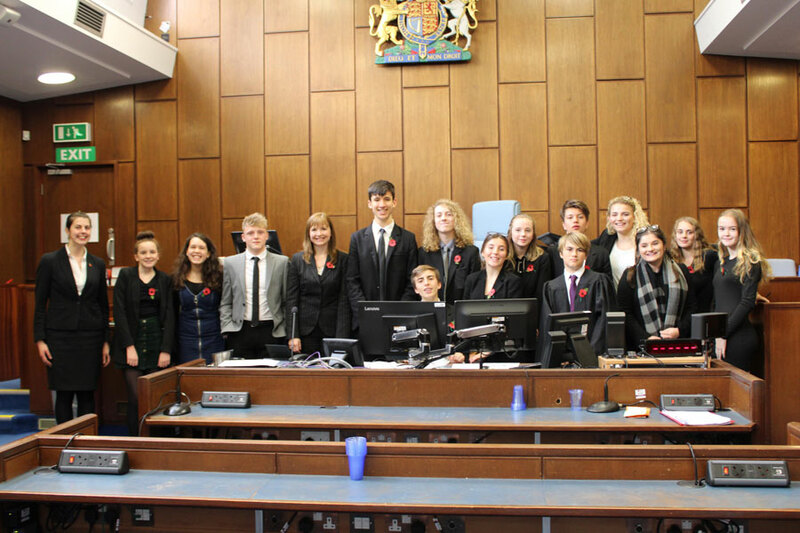 A team of Looe Community Academy students recently participated in the Bar Mock Trial Competition 2018, hosted at Plymouth Crown Court, delivering impressive performances against older opponents. This competition helps young people understand how the judicial system works. The teams are predominantly made up of Sixth Formers and college students with an interest in law. Not having a Sixth Form, Looe entered a younger team from Years 10 and 11. The students take on the roles of barristers, witnesses, jurors, court clerk and usher, entering both a prosecution and defence team that go to trial against other schools with two cases, specially written by legal experts. Case One was Grievous Bodily Harm via an acid attack, and Case Two was two counts of the Proceeds of Crime Act, namely money laundering. Looe’s prosecution team, comprising of barristers Harry Barlow and Scarlett Crago; witnesses Laura White and Nat Knight; and court clerk Tayte Pilcher-Wilson, went up against Petroc College (North Devon) in round one; and St Ives School (Cornwall) in round two. The defence team, comprising of barristers Joelie Fisher and India Mullings; witnesses Katie Tatt and Ben Farrell; and usher Matthew Gilbert, went up against Plymstock School in round three. Isabelle Warburton, Emma Price, Lilly Spry and Jacob Owen sat as jurors observing three trials of opposing schools and decided on the verdicts of innocence or guilt. The judges for the Plymouth heat were HHJ Peter Johnson from Exeter Crown Court, HHJ Simon Carr from Truro Crown Court and Mr Rupert Taylor, Criminal Barrister from Devon Chambers. Both the defence and prosecution teams from Looe performed magnificently; they offered excellent opening and closing statements and their examinations-in-chief and cross-examinations were highly effective. Although the team did not win this heat, they did receive praise from the judges for the high standard of our performance, and their strong performance against older opponents was noted. Liskeard Sixth Form Student Drew Clark represents Cornwall at the English Schools’ Cross Country Championships.